5 techniques combining content Marketing and Automation to identify your sales-ready leads . Marketing Automation is most effective and scalable in B2B markets when you implement rules to identify sales-ready leads using lead scoring and lead grading to identify the interest and fit of your prospects. Writing on the Sparklane blog, Sam Hurley, explains how to create a lead-scoring matrix in 5 easy steps. This is the technical side to automation, but to make automation successful, you also need the creative side. This is using creativity to find the best types of content and communication to nurture your prospects so you can engage and then identify them when they become sales ready. In this article, I’m going to show you 5 techniques which will help you identify your sales ready leads better. They follow the principles of ‘Sense and Respond’ where by creating the right types of content, you will be able to sense their level of interest in your solutions and then follow-up with a nurture email, or if the lead score and profile is right, a sales call. Before we look at the techniques, let’s start by looking at the full range of opportunities for using content marketing during lead generation and nurture. 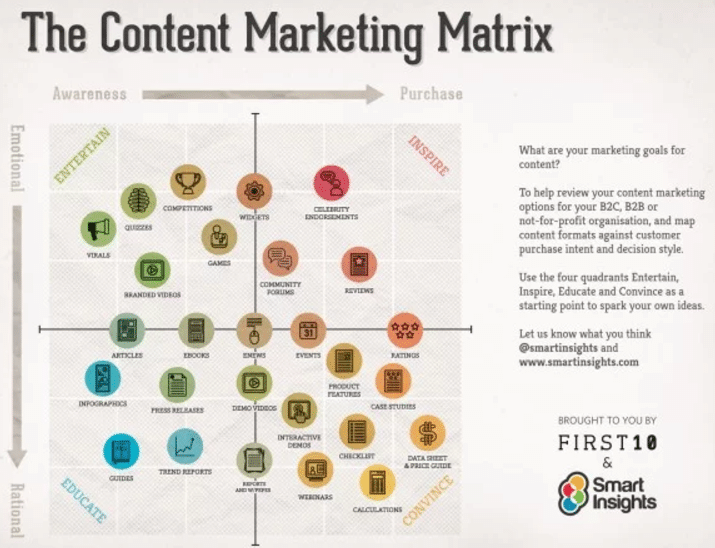 We created the Content marketing matrix as a ‘mindtool’ to help marketing teams and their agencies think through their options for using content to support marketing automation. You can see that the matrix shows different content formats and how you can deploy them at different points in the funnel shown from top of funnel (TOFU) on the left to Bottom of Funnel on the right (BOFU). To best identify sales-read leads from the types of content they are reviewing, having the right types of BOFU content is particularly important, but as we’ll cover, TOFU content can also be used to identify sales-ready leads. The matrix also shows content divided into more rational content which is often static and more engaging content which is typically more visual and interactive. The idea behind our matrix is that you can audit different types of content at a top level using the content marketing matrix to identify the gap between content your using now and what you could in future. Often, in B2B marketing, you will see an imbalance, so for example, you may have too much rational, TOFU content in the sector in the bottom left of this chart. With this foundation covered, we can now look at the 5 automation techniques to get the relevant content in front of your audiences to support nurture to sale. The first of the three techniques here are email-based, the others are other automation techniques every business should consider or optimize if they’re using them already. When a prospect is added to your list as a new subscriber, often in response to TOFU content, your first email to them can be seen as the most important type of email you send. Here you’ll have the highest levels of attention and, if you get it right, you should be getting open rates of more than 50% or click-through rates of more than 10% (see the Smart Insights email marketing statistics compilation for how you compare). Yet, often the first email isn’t effective, it simply says ‘Thank you for downloading our report’ or similar with a link. It’s a huge missed opportunity. Instead, I recommend your thank you welcome message also contains relevant MOFU and BOFU content to engage your audience in your brand, solution and to nurture them. For example, when someone downloads our TOFU content on creating a digital marketing plan, our welcome email asks them ‘How does your digital marketing compare?’ with a link to an interactive tool for marketers to assess their work. This is a piece of MOFU content which helps the subscriber, but also explains more about our proposition. It also gives us far more insight than a link to a PDF. But don’t stop with a single welcome email! Again, that’s a common missed opportunity! By crafting multiple, well-branded emails in a welcome sequence rather than a single, simple autoresponse you can tell the story of what your brand can offer subscribers and give different options to engage the audience. We’ve designed a three message welcome or nurture sequence which is personalised based on profile information and links to MOFU and BOFU content. These are personalised by role or industry. This is easy to set up in automation with a separate email, but it does take time to set up the emails, with a separate mail being sent for each role or industry. By personalising in this way we found we got 3 to 5 times more response on each email compared to a non-personalised follow-up. You can use measurement of the differences in response by role or industry to improve your messaging or the content offer. Once a subscriber completes the welcome sequence, they should then be added to the nurture programme which should give less frequent emails reminding subscribers about a problem or opportunity they may have and how your solution can help. Remember, that although it’s common to feature a single content asset in a single email of a nurture programme, there is no reason why you couldn’t offer multiple assets so they are more likely to fit the prospects stage of evaluation, so rather than only featuring a case study, you might also want to feature a product comparison sheet or analyst report. You should also have the right calls-to-action so that the prospect can contact you when they’re ready, for example using a call back. Newsletters also have a role in nurture and are, I think an essential component of automation, although since they are often static and for customers as well as prospects, they may not be thought of as an opportunity for automation. Newsletter are effective since they can help keep professionals in an industry up-to-date and support their career development, so a good quality newsletter that supports this will often have better response than more promotional solus nurture emails. The automation technique here is to design your newsletters with separate panels or a section of editorial which use dynamic content insertion. This can then recommend the next best content asset to support nurture. Note that the ease of setting up and tracking the impact of dynamic content can vary with different automation systems, so it’s worth checking what’s available with different automation vendors. Next, we move away from email to briefly look at two other options for nurturing with content. 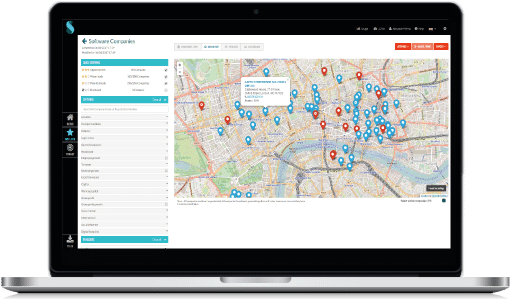 Web-based personalisation is widely used in some sectors, so in retail, for example, we’re all familiar with recommended products and summaries of which related products customers bought. Yet in B2B and high value, high complexity consumer markets, website personalisation is used less commonly. This is a missed opportunity since the footfall on your website enables you to give content recommendations for nurture, perhaps reaching people who aren’t interacting with your emails. There are now more cost-effective tools to enable personalisation, some of which use automated machine learning to recommend the most relevant next content asset to nurture. Finally, off-site retargeting is quite a common missed opportunity also. Considering retail again, it’s routine for retailers to use retargeting platforms such as Criteo or the native retargeting available on Facebook and Google to remind site visitors about relevant products and promotion. This is effectively automation since you are using the retargeting platform to remind an individual based on a cookie or pixel from when they visited your site. Opportunities for recommending content for nurture using retargeting have been available since Google AdWords introduced its AdWords Remarketing programme several years ago, although it has been extended, for example through RLSA (Retargeting lists for search ads) where content recommendations can be displayed in Google when there is a relevant search. Facebook now also has a retargeting programme which can be relevant in some B2B sectors. LinkedIn has also recently re-launched its retargeting and programmatic options, so those are worth taking a special look at. So, that’s the 5 techniques, I hope they are interesting and useful to compare against your automation approach. These are straightforward approaches that every business serious about automation should follow, but although they are simple, in my experience, they are often missed. I think this is for two reasons, first businesses aren’t fully exploiting the email marketing features of their automation system. Second, they may think of automation as being limited to email marketing and the business is not set up to use the other techniques which can also be considered automation, i.e. automatic nurture techniques aimed at delivering relevant content to an individual to engage them.